Too often, we worry about what we can’t do, rather than what we can do. We allow fear to creep into our mindset. We hear doubts and their negative whispers. Yet we sometimes forget that God has blessed us with unique talents and wisdom and determination. Whatever God asks us to do, we can do. We can see it through, we can complete the task. What He asks of us is to have faith and be willing to be guided in our journey. We can do that. We are survivors. We can work hard, walk in wisdom and try to make sure that our thoughts, words and actions align with our faith in Him. All the while, we must trust Him to work out His good plan for our life. 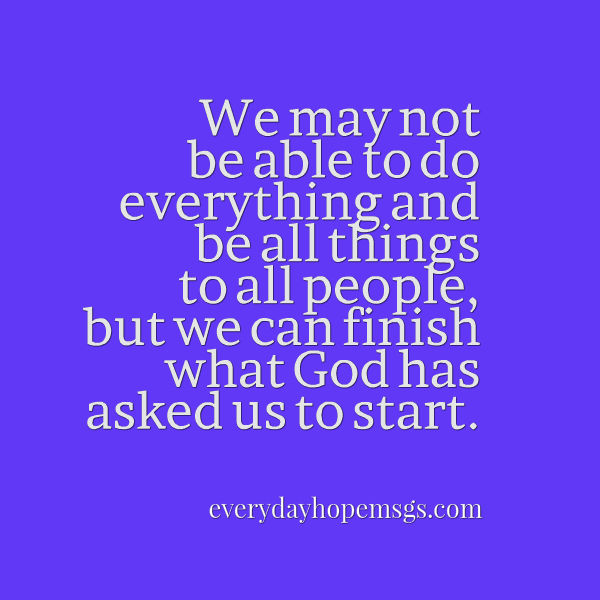 We may not be able to do everything and be all things to all people, but we can finish what God has asked us to start. We can be committed. We can be disciplined. Focus on your strengths, focus on what you can do. Focus on the progress you make today and feel great with what you’re able to accomplish.